Dogs need to be exposed to many different types of people, animals and situations to be well-adjusted, well-mannered social companions. Socializing your dog will help him become more stable, happy and trustworthy. While the foundation for good behavior is laid during the first few months, you should encourage and reinforce social skills throughout your dog’s life. Socialization should continue until your dog greets every new person or situation with confidence and ease. This could take months or years. Each day, your dog will likely encounter a spectrum of people, animals, environments and noises. Undersocialized dogs can become fearful of what they have never seen or met. This fear can manifest as aggressive behavior toward a person, animal or experience. It’s your job to help your dog learn how to cope and respond to these stimuli in a healthy and acceptable manner. One of the best ways to help socialize your dog is to enroll in a training class that supports you and your dog and teaches you both how to manage various situations. It is important to make socializing a positive experience for your dog. Your dog should have time to bond with you and family members first. Don’t go too fast, especially if your dog lacks confidence or is shy. While socializing, it is important to remember that all dogs are individuals. Take your cues by watching your dog’s response. There exists a window of time during a puppy’s development where he is curious and open to new experiences. During this period, it is important to introduce your pup to new situations, even if he is reluctant or scared, so he can develop the ability to deal with stress. This will increase his overall confidence as an adult. This starts with you the owner from as early as possible to desensitize your dog to touch and allow the entire body to be handled. Paws are often a sensitive area especially when being groomed and so working on handling the feet and toe nails from an early age is a must. The use of food/treats is a great way to desensitize sensitive or ticklish areas by rewarding after the touch. Also controlling your puppy’s excitement is also important. Impulse control at an early age is very helpful. An aversion or fear toward surfaces and objects is very common during your dog’s life especially during puppyhood. Encouraging your puppy to walk and play on every surface from concrete to wet grass, frost or snow. The use of treats and plenty of encouragement with fun play, may well be what your dog needs to either show no fear to the surface/object or counter condition the fears. Work on teaching your dog to interact and play on all different surfaces using food and play as a reward for a positive experience and association. 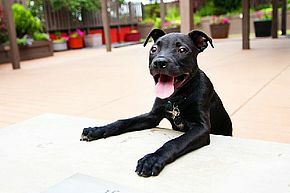 Teaching your puppy that new environments are fun and to be enjoyed not feared is essential. Change from quiet suburbs to loud cities can be stressful. Inside a new building or at an event or festival can be a tough challenge for most puppies. Some useful tips to remember when your puppy is about to partake in a new environment. Keep an eye out for stress signals like cowering, lip licking or heavy panting or trying to escape and avoid the situation. If it’s not working, don’t force it. Start by bringing high-value treats or your dog’s favorite toy. This helps your dog associate meeting new people with something pleasant. Teach your dog to “hand target” or touch his nose to your outstreached hand. This can be done by standing in front of your dog and holding out an open hand, about two inches from his nose. When he moves forward to sniff, say "Yes!" and immediately reinforce with a high value treat. Repeat until your dog touches your hand 9 out of 10 times. You can then add a cue or verbal command. If you want to use that hand target to help introduce your dog to strangers, you can use a cue such as "say hello!" and reinforce him for touching other hands. 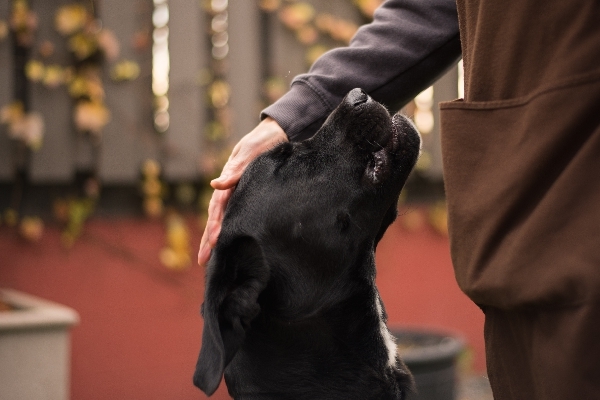 By giving a treat, this may help to teach your dog that approaching people brings good things. Set up meetings with other people. Have helpers approach sideways at first in a nonthreatening way. If your dog becomes overaroused, avoids or freezes, try creating a bigger distance and have the person toss some treats. Remain patient and calm. It’s important to teach your dog that good things happen around people. Expose your dog to a variety of people. It is a good idea to socialize your dog with people of different ethnicities and ages, as well as people wearing or using items such as baseball hats, costumes, wheelchairs, bicycles, skateboard, big coats and glasses. Exposure to children playing, toddlers squealing and infants crawling is important, too. Don’t hesitate to contact one of our trainers if you need help or are having issues. Start by having treats on hand so your dog will associate new experiences with good things. Be sure to praise good behaviors (sniffing, walking calmly or sitting politely) with a treat. Undesirable behaviors should be ignored while trying to redirect your dog’s attention to you. Bathing, nail clipping, a trip to the vet, passing buses or bicyclists, walking on a leash, getting groomed and loud noises are a part of everyday life. But they can be intimidating or frightening to some dogs. If you have a fenced-in backyard, your dog is more likely to become undersocialized. Take special note to take your dogs on walks to meet the neighborhood sounds, people and animals. Your dog is going to encounter many animals in his life. If you adopted a puppy, he likely had experience with dogs from being in a litter. Once your puppy settles in and has had time to bond with family members, enroll in a puppy class. A good puppy class not only teaches beginning obedience skills but also allows time for socialization with other puppies and people. If you adopted an older dog, you may not know his past history with other animals. It is important to take it slow and start by identifying what he is and is not comfortable with. You can start by setting up meetings with other friendly, nonreactive dogs. You should first watch your dog’s reaction as you approach the other dog. Your dog should have calm, relaxed or playful body language before you follow through with an introduction. If your dog becomes overaroused, avoids or freezes, increase your distance. Find the point where your dog relaxes and is motivated to take treats. This is your starting point. Obedience classes, agility and doggy daycare are great ways to keep your dog social with other dogs. Again, don’t hesitate to contact a trainer if you need help or are unsure. Careful planning can help ensure a smooth transition for everyone.